restylingmag.com May 2015 | Restyling & tRuck AccessoRies 41 wrapped with the right stuff as well—admirable character traits. Do You Possess anD Project the right stuff? Consider how you come across on a personal level, and how a customer would rate you in these areas: trustful The most important ingredient of any rela- tionship is trust. You will never be able to connect with a customer or develop any relationship without it, for trust is the foundation for reliability, dependability and good faith. Being a person who can be trusted plays a key role in your ability make a sale. You don't automatically gain peoples' trust, even if a customer was referred to you. You still need to earn it. Showing a customer a great restyle job is one way to earn customers' trust. ethical Display the highest moral standards by always doing what's right. If you don't, you will pay the price. Think about those exec- utives who did not live up to the highest moral standards and ended up on the front page of the business page—with indictments. This is a bit extreme for most mid-sized and small business owners, but being ethical is critical to your reputation. sinceritY Be sincere and sound sincere when inter- acting with customers and potential customers. If you come across as phony, smart customers will see right through you. Demonstrate sincerity by genuinely listening to customers and conveying that you care as much about their needs, wants, and desires in their vehicle upgrade. confiDence If you want to gain customers' confidence, you must project it yourself. This is impor- tant throughout every interaction in your business. Customers will be listening for the confidence behind the words you speak. Your self-assurance demonstrates that you believe in your business and yourself. honestY Being upfront and honest is equally impor- tant. Never "stretch the truth," "tell a little white lie" or omit facts to win a sale. 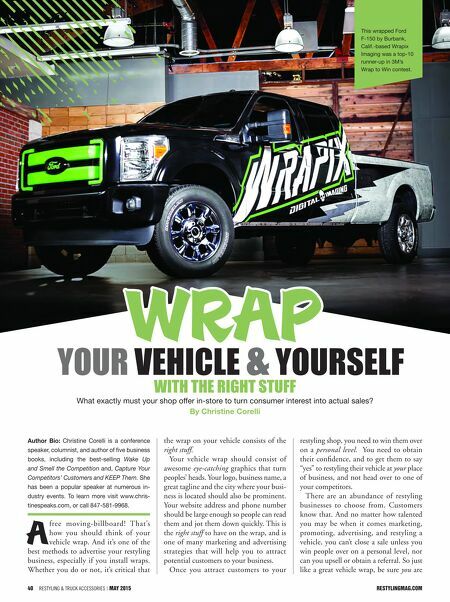 When things go wrong or a problem occurs, the old adage honesty is always the best policy restylingMag.coM May 2015 | Restyling & tRuck AccessoRies 41 Daren Merkle of Shadow Graphix in Indianapolis won the 3M Wrap to Win contest by transform- ing the Jammin' Joi's food truck. Merkle will soon embark to Bora Bora, his reward for winning the contest. Metro Signs Inc of Hollywood Fla., wrapped this top-five runner-up in 3M's Wrap to Win contest.